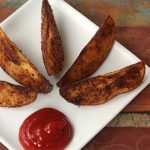 Slice potatoes into wedges, about 8 per potato (do not peel potatoes). Put into gallon size zipper-top plastic bag. Drizzle with olive oil. Combine chili powder, cumin, and garlic pepper in a small bowl, then add to bag with potatoes. Seal the bag and squeeze it, moving the potatoes around, until the spices and oil are evenly distributed. Dump the potatoes onto a baking sheet and separate them. Bake for 15 minutes, then turn wedges over and bake another 10 minutes or until done. Feel free to try other spice combinations or cut the potatoes in different shapes.